High temperature material systems: Ni-base superalloys, ultra-high temperature ceramics (UHTCs), ceramic matrix composites (CMCs), refractory alloys, thermal barrier coatings (TBCs), energy materials. Digital image correlation (DIC) is a popular and versatile method for measuring full-field strains. At high temperatures, test specimens emit light that interferes with camera sensors. The light is less bright at shorter wavelengths and can be mitigated using ultraviolet (UV) cameras and filters. UV-DIC has been demonstrated to higher temperatures than conventional DIC, but the upper temperature limit of UV-DIC remains unknown. For more information, see our paper in Review of Scientific Instruments. This work is supported by an NEUP Infrastructure Grant from the US Department of Energy. 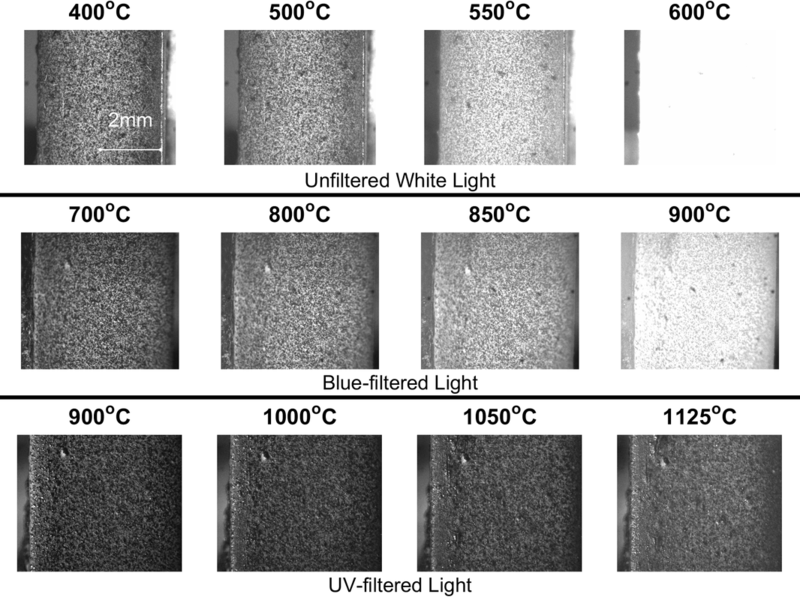 Images taken from a specimen surface at the temperatures indicated using unfiltered, blue-filtered, and UV-filtered light. The UV images remain minimally affected at temperatures above which the other filter conditions have saturated. During hypersonic flight, critical components are subjected to vibrational loads on the order of kHz and temperatures on the order of 1500°C. Should such loads result in resonance, large displacements can greatly interfere with structural performance. By mapping the full-field resonant mode shapes, we can provide robust validation data for structural dynamics simulations at extreme temperatures. Left: First 9 resonant modes of a vibrating plate, obtained using FEMAP. Right: Experimentally observed resonant modes obtained at high temperature using DIC. Thermo-mechanical fatigue (TMF) is characterized by cyclical changes in load and temperature, and is often more damaging than isothermal fatigue at the same temperatures. TMF is a complex, multi-physical phenomenon with many variables to consider, including the minimum and maximum load, minimum and maximum temperature, the lag time between heating and loading cycles, material composition, and environmental factors. Despite this complexity, the available data for evaluating TMF performance remains limited. One of our ongoing efforts is to establish a database that pairs macro-scale life estimates with multi-scale heterogeneous strain measurements to explore TMF behavior across length scales. This database will provide robust datasets that help to better understand the micro-mechanisms of TMF and identify design strategies to extend TMF life in extreme environments without sacrificing performance. Typical TMF heating and loading profiles. The most widely-embraced method for high speed mechanical characterization is the Split Hopkinson Pressure Bar (aka Kolsky Bar), depicted below. As stress waves propagate through the bars, strain gauges measure the mechanical response to compute the dynamic properties of the material specimen. By pairing this system with the various heating equipment in our lab, we can characterize mechanical performance under high-speed / high-temperature loading conditions for applications such as the aerospace, defense, and manufacturing industries. In the wake of the Fukushima nuclear incident, there has been considerable interest in developing better fuels and cladding to withstand accident conditions. However, further mechanical characterization is needed before such materials can be approved for long-term structural use. This summer, the USU Mechanics at Extreme Temperatures Lab will be adding a new creep frame to test candidate materials for accident tolerant fuels.